To tell you the truth, I am stuck. Having converted another great video of Hawa Dramé from tape to digital format, I found the result is just over twelve minutes. YouTube has a limit, however, of nearly eleven minutes. And I simply refuse to cut the video in two. Perhaps there is someone who can point me in the direction of an alternative that will accept a twelve minute clip. Meanwhile, I have two Hawa Dramé related items. First, here is a video of Hawa Dramé's daughter Assa Bagayogo. I just love this pentatonic Bambara music. The video was recorded (probably in 1986) by Malian television in Ségou, the heart of Bambara country, and everything about it is authentic, including the dancing and the clothes worn. 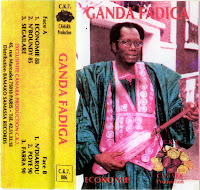 The second item in this post is a cassette by Hawa Dramé's friend (and I have heard rumours that at one point he was more than that..) and accompagnateur Ganda Fadiga. Wow thanks! Really is amazing all your work. i have never expected to hear "Ganda Fadiga" here. He mostly sing in soninké( sarakole). He is a wonderful history-and-story teller. In his "Economie" he mostly talks about "soninké immigrants" living in Europe and US who have been sending money in MALI or who have given him money or something precious. I hope to hear more from him here! @Momo: I can't imagine why you never expected to hear Ganda Fadiga on this blog. I already suspected he was singing in sarakolé, but thanks for the confirmation. I will post more of him, and of other 'talkers'. @WrldServ: I said that i have never expected to see here because Even in Mali,you are more likely to see only "sarakolé" playing his tapes, but he is still well known. and dont play the "ngoni" due to his age and health condition. Thank for this, and welcome to Fadiga in worldservice,for read some of him and see him playing,come here to visit the Soninke world. Thanks for that useful information, CBSB! Thanks World Service, this is very nice indeed. It was the first Ganda Fadiga K7 I got (in '94) and still sounds to me the best.